Springtime is infamous for a condition called ocular allergy, or eye allergy. Also known as allergic conjunctivitis, ocular allergy occurs when something irritates the membrane covering your eyes. This leads to symptoms like itching, redness, and swelling. Below are common causes, and ways to manage the condition. With the approach of spring comes the invasion of pollen. 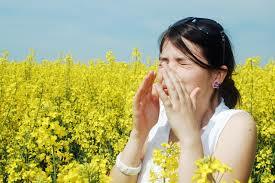 As plants start to bloom, pollen is released into the air, causing eye irritation. Here are some facts about allergens that occur outdoors. Grass – Grass pollen is highest during the late spring and early summer months. Although there are numerous types of grasses, the pollens are similar on all of them. So if you suffer from grass allergies, then you will likely experience the problem no matter where you live. Flowers – While people commonly believe that the brightly colored flowers blooming in the spring are the cause of their allergies, this may not be the case. It’s true that these flowers can cause allergy symptoms if sniffed up close, but because they are pollinated by insects instead of the wind, the irritation they cause is minimal. While indoor triggers are present all year, there are a couple of reasons you’ll notice an increase in symptoms during springtime. Pet Dander –Being allergic to pet dander is extremely common. Many pets begin to shed their winter coat as the weather gets warmer. This leads to even more dander than normal, resulting in an increase in allergy symptoms. Dust Mites – Yes, dust mites exist year-round, but if you participate in “spring cleaning,” you may notice an increase in symptoms during this time. If your ocular allergy condition is being caused by indoor triggers, use special air filters to reduce allergens. You should also limit exposure to any pets that may be causing your symptoms. It’s difficult to control the outdoor environment, but there are things you can do to minimize your ocular allergy pain. Wear a hat and sunglasses to protect your eyes, and apply eye drops after being outside. To find out if you’re suffering from ocular allergy, schedule an eye exam today.